Overview When selecting this wine I was choosing something that I believed would be a simple drink. Nothing mind blowing or overly complex, just a nice drink that I could sit down, put my feet up and enjoy. It was probably the price tag that made me think this, $11.99 I think I bought it for. The wine in the glass, however punched well above its weight, floored me, put me down for the count and made me feel guilty that I was drinking this on my own and not sharing it. I should have seen it coming really, those Spaniards are notorious for making great, inexpensive red wines. Where I really discovered the great potential of this wine was when I matched it with food, the spice and fresh fruit came to life when paired with fennel seed and pepper crusted pork. Tempranillo and Shiraz are great partners. I’ve seen many, great cheap wines of this blend out of both Spain and Italy. Both have different dimensions of fruit and spice that lend to one another. This wine does not see oak which adds vibrancy and freshness which can sometimes be missing in a red wine. This wine has the Spitting:Optional guarantee. Try it and if you don’t like it I will not give you back any money but subject you to a stern talking to. Tasting note: An attractive, floral nose with tones of strawberry, blueberry and white pepper these characters carry on to the palate with savoury spice, crushed rosemary and finishes with grainy tannins. It is reminiscent of a good, entry level Cote du Rhone. Final Say: Looking for an inexpensive wine to impress with? Look no further, pick it up for between $11 and $15 and enjoy. Overview: The strong Australian dollar has wreaked havoc on our attempts to export wine into other countries. On the other hand however, it has made it cheaper for distributors to export international wines to our own shores. As a result there are some great, reasonably priced international wines floating about at the moment and this wine is one of them. 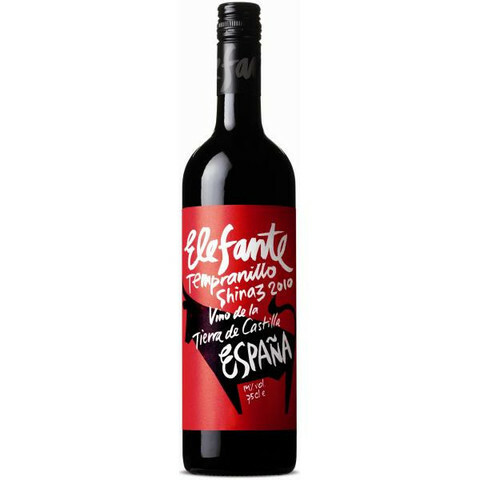 Elefante means elephant in Spanish, der, however the symbol for the Elefante wines is a bull. I’m not really sure what the meaning is there, perhaps something is lost in translation. Perhaps it’s some deep metaphor. Like this wine is so large like an elephant that it is a bull. I should write anecdotes for Buddhists. I really don’t know, I tried this wine when it was first launched in 2009 and while impressed by its value for money, the Elefante/Bull confused me, it still does. So much so, even as I write this I am perplexed. Someone please help me solve the Elefante/Bull code before my brain heads into a mess of trucks, horns and hooves. Long story short, this wine is absurdly good for the price. Very funky packaging lets it jump off the shelf. From reading the wine making practices it seems some good quality fruit goes into these wines. The Tempranillo vines are ‘Goblet’ bush vines which are low yielding. Low yields= fruit intensity (in most cases). Final Say: Looking for a cheap crowd pleaser? Give this little blend a go. You can’t go wrong for $10-$12 a bottle.